​A very warm welcome to The Sebright Club of Great Britain. 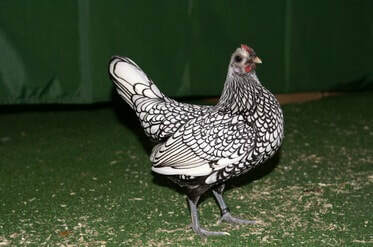 The Sebright bantam was named after its developer, Sir John Saunders Sebright, an English politician and agricultural innovator. 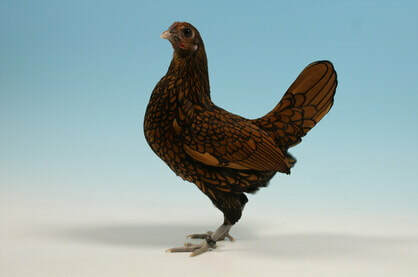 It is one of the oldest recorded British 'true bantams' - meaning it is a miniature bird with no corresponding large version of the breed. It was created early in the 19th century through a selective breeding program designed to produce an ornamental breed and one of undeniably stunning beauty. Membership costs £10 per year and an application form can be found here - Membership Form. Our newsletters are available to paid-up club members and you will have unlimited access to this website. The membership fee also goes towards providing rosettes and prize cards at Shows, amongst many other benefits. 2012 was a very special year for us as we celebrated 200 years of The Sebright Club - the very first Poultry Club of its kind. We produced a Special Anniversary Yearbook, brimming with interesting and informative articles - and there are still some limited copies available. If you need new or replacement birds contact our secretary Charles who has a current list of breeders from across the country with stock for sale. As a club we are there to offer support and advice - whether it is a welfare concern you may have, problems with breeding and hatching, housing, genetics or anything else. Alternatively you can always just ring for a friendly informal chat! In The News will keep you up to speed with Sebright successes up and down the country and Sebright Club news. And if you are thinking of keeping the breed Show Dates & Results will point you in the direction of forthcoming shows where you will be able to pick the brains of breeders and exhibitors alike. And why not join in the lively conversation at the Sebright Club of Great Britain Facebook page for up to the minute debate, discussion and photos. So if you have just two little Sebrights in the garden as companions - or breed and show with great success - you are all most welcome to join our Club and by doing so we can ensure that the interest and longevity of this breed will continue for at least another 200 years.